Talk about a critical darling! 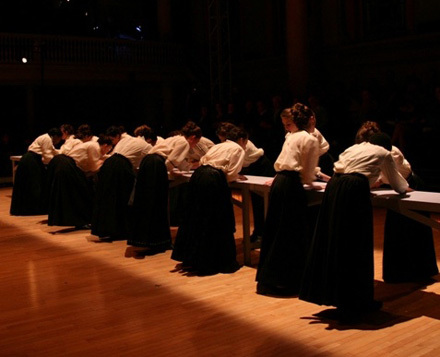 After sweeping through the Edinburgh Fringe Festival, Triangle: From the Fire, the original oratorio commemorating the hundredth anniversary of the Triangle Shirtwaist factory fire, has earned an Emmy nomination. WNET-Thirteen’s Triangle: From the Fire, a video feature about the piece’s New York debut at Judson Memorial Church last spring, was recently nominated for a New York Emmy Award in the category of Historical and Cultural Feature or Segment. Written and directed by faculty member Cecilia Rubino, scored by 2010 Visiting Artist Elizabeth Swados, and starring students of Eugene Lang College The New School for Liberal Arts, Triangle: From the Fire tells the story of the Triangle Shirtwaist Factory Fire, the single greatest workplace tragedy in New York City before 9/11. The fire claimed the lives of 146 immigrant garment workers, mostly young girls, and initiated a movement for workplace safety in New York City and across the country. The WNET-Thirteen team, including Joan Hershey, Rafael Pi Roman, and Kevin Alexander, will attend the New York Emmy Awards ceremony on April 1 in hopes of taking home to big prize. Watch a clip of the nominated segment here.